Piston compressors are 1-, 2-, 3- or 4-cylinder versions, corresponding to the compressed air demand or the level of pressure required of them. 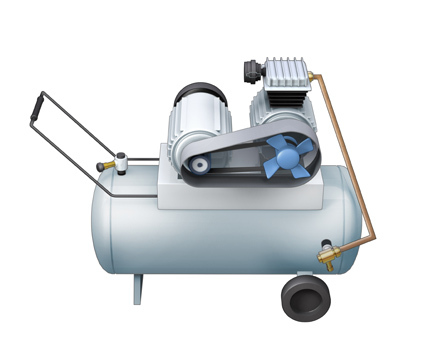 With a 2-cylinder compressor as “parallel switching”, the generated air volume is doubled. In “series switching”, where the output of the first cylinder is connected to the input of the second cylinder, higher system pressures are achieved. A piston compressor consists of a crankshaft, a connecting rod, a cylinder and piston and a valve head. The crankshaft is driven via a V-belt, usually by an electric motor. There are small models which only consist of a motor with cylinder/piston. However, most compressors have a compressed air tank, in order to maintain a stable system pressure to the compressed air consumer. The operation of compressed air tools leads to dropping pressure in the tank. When the pressure drops below the lower limit, the motor starts; when the upper limit is exceeded, the motor automatically switches off. Pressure switches ensure a stable system pressure within the set limits (switch points). The pressure in the tank, so the available working pressure, and thus also the function of the on/off switch, is reliably indicated by the WIKA pressure gauge.